If you're looking for a comprehensive guide for how to get your eLearning project off to an amazing start, then you've come to the right place. 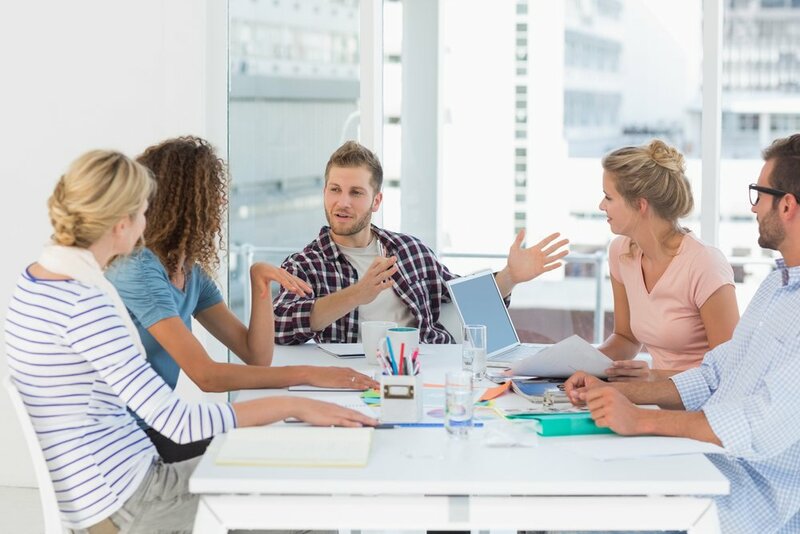 In this article, I'll offer some helpful advice that you can use to make your next eLearning project kickoff meeting a success, regardless of your project budget, audience, or subject matter. I'm a firm believer in the notion that anything worth doing is worth doing right. This is especially true for eLearning project kickoff meetings. After all, the productivity of your kickoff meeting (or lack thereof) can mean the difference between an eLearning course that misses the mark and one that hits the target. In this article, I'll offer you a step-by-step look at how to hold a successful eLearning project kickoff meeting that lays the foundation for creating a successful eLearning course. Determine the eLearning project goals, expectations, and roles. Before you choose the meeting date and create the agenda, you'll need to decide what you are hoping to achieve in the meeting, what will be expected of each eLearning team member, and what roles each person will have to play in order to meet the eLearning project goals. It's important to be clear and detailed about your expectations, as well as what responsibilities every eLearning team member will have moving forward. This will avoid confusion once you begin the eLearning project design and development process. Also, if you are enlisting the aid of a subject matter expert, figure out what part he/she will play and how involved will he/she be in the eLearning project itself. In addition to gathering your eLearning team members and allocating their roles, you will want to determine which key resources you have at your disposal and how you can most effectively utilize those resources for designing an eLearning course. These eLearning tools and technologies should not only cater to the needs of your learners, by giving them the interactivity and immersion that will boost knowledge retention, but they should also cater to the skills and talents of your eLearning team members. For example, if you are opting for an eLearning authoring tool that may offer you the flexibility you need, but is too complex for your designer to use, then it won't be of much use to you. In addition, it's essential to know which free web conferencing tools and free project management tools you will be using, especially if you are all working remotely. Create a set of “ground rules” that include how often each member of the eLearning team needs to touch base, assign deadlines, and specify your preferred method of contact. One of the most important tools you should have at your disposal when holding your eLearning project kickoff meeting is an outline to serve as a guide. This may come in the form of an agenda or a chart that highlights the goals of the meeting and what each individual time slot will entail. It's often best to issue this outline to the meeting participants in advance, so that they can be prepared to discuss the topics or address any concerns they may have before you dive into the design and development aspect of the eLearning course. By doing so, every member will be well informed and ready to participate in the meeting. Discuss the specifics of the eLearning project. During the actual meeting you will want to leave plenty of time to discuss the specific details of the eLearning project, such as how long the eLearning course is going to be, the eLearning course seat time, how many slides are going to be featured, and any technical requirements that you will need to consider such as the delivery platforms, browsers, and the possibility of going mobile. In addition to these key details, you will need to let your team know about any major milestones or deadlines that pertain to their part of the eLearning project, and find out if any contributors need time off during the project timeline for personal or professional obligations. Specify how each member will work to meet the objectives. Once you've sat down and discussed the eLearning project objectives and other details with your team members, you will want to specify how each contributor fits into the grand scheme of things. What actions or tasks do they need to carry out in order to get the job done, or how will their expertise or skills help the entire team to meet eLearning project goals? Break your eLearning project down into manageable steps, then determine which members of your team are going to be involved in each step, how much time they will have to put in, and any other important details that are critical to the success of the eLearning project. Get feedback and address any questions or concerns. At the end of your eLearning project kickoff meeting, it's important to leave room for feedback and questions. Chances are that at least a few members of your team are going to have questions that need to be answered before moving forward or concerns that must be addressed before they can do their job effectively. If they don't have any questions, then take this time to get their feedback and input about aspects of the project that may be a bit unclear. For example, if you aren't sure if a particular learning activity may be ideally suited for the eLearning course, then ask their advice. This is your chance to pick their brains, so to speak, so that you are able to benefit from their talent and experience. This eLearning project kickoff meeting article can make your next meeting organized, productive, and successful on every level. Keep it on-hand to hold a meeting that serves as a cornerstone for your next eLearning project. In addition, the article Time Management Tips For eLearning Professionals features 7 helpful tips on how to save time and meet deadlines when designing and developing your eLearning deliverables. Last but not least, are you looking for tips to boost collaboration within your eLearning design and development team? In the article How To Boost Collaboration Within Your eLearning Team you will find 9 top tips and techniques that can offer you and your eLearning team the chance to improve communication, streamline your efforts, and effectively handle any challenge that an eLearning project throws your way.